How to tie the Midshipman's Hitch Knot. The Midshipman's Hitch is an excellent knot to create an adjustable loop at the end of a rope. The knot can be slid up and down the standing line to increase or decrease the size of the loop (and thus the length and/or tightness of the standing line) but when load is applied the knot holds securely. The Midshipman's Hitch is similar to the the Tautline Hitch and the Adjustable Grip Hitch, but has one important difference and benefit. When tying the Midshipman's the second wrap forms an intermediate "Awning Hitch" which takes any strain on the rope while tying the final Half Hitch. The completed Midshipman's Hitch is also more secure than the Tautline. This knot is relatively easy to tie or untie under load. 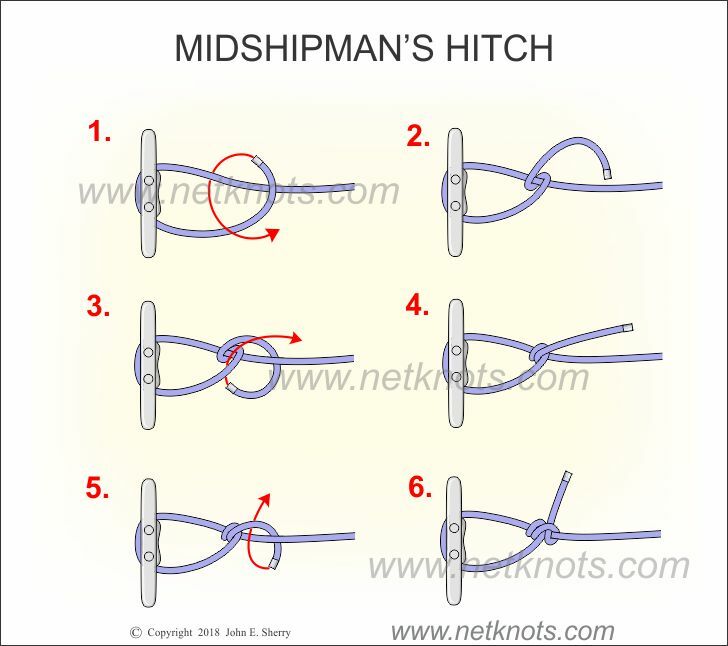 Scroll to see Animated Midshipman's Hitch Knot below the illustration and tying instructions. Pass the working end of a rope around an object such as a post or cleat. Pass the working end around the standing line creating the first Half Hitch. Pass it around again, working back away from the object toward the standing line. Pull tight. This forms an Awning Hitch that can take load while the next step is tied. Now make a half hitch in the same direction outside of the loop around the standing line. Pull the knot tight. The Midshipman's Hitch can now be slid on the standing line when there is no load and will hold tight when load is applied.